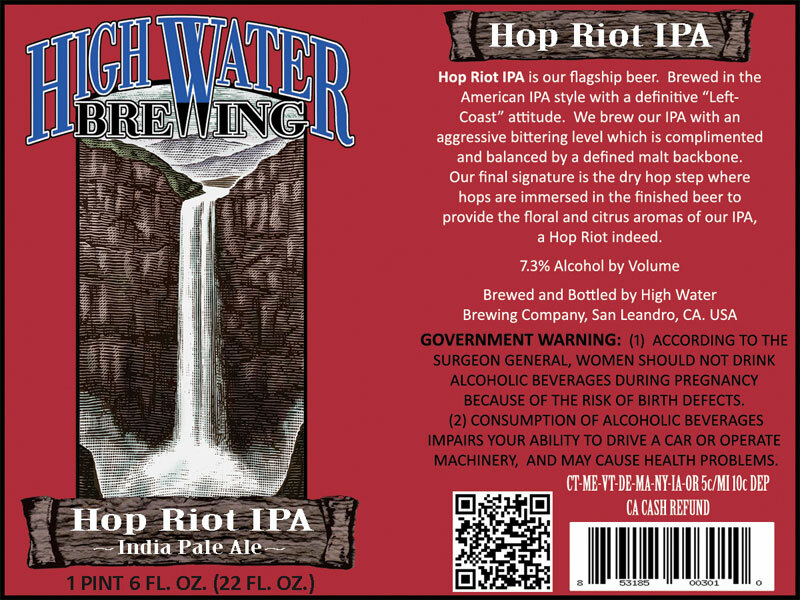 From High Water Brewing – Hop Riot IPA is out flagship beer. Brewed in the American IPA style with a definitive “Left Coast” attitude. We brew our IPA with an aggressive bitterning level which is complimented and balanced by a defined malt backbone. Our final signature is the dry hop step where fresh hops are immersed in the finished beer to provide the floral and citrus aromas of our IPA, a Hop Riot indeed. 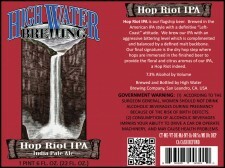 High Water Brewing – High Water Hop Riot IPA – On tap at The Bruery Provisions. – 7.3% abv. Appearance: Pours an amber tinted yellow gold with a small film of white suds. Aroma: Candied lemon and grapefruit, earthiness and toffee. Taste: Bitter citrus like hops, earthy yeast and slightly sweet malt. Bitterness lingers for a fairly long duration. Overall: Tasty, hoppy, a little spicy. A great IPA ready to run with the big boys.